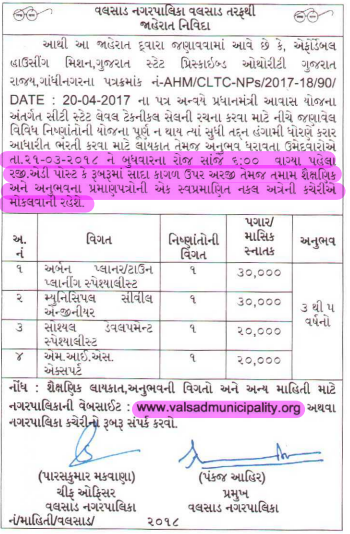 Valsad Municipality has published Advertisement for below mentioned Posts 2018. Other details like age limit, educational qualification, selection process, application fee and how to apply are given below. Educational Qualification: Post Graduate or graduate Degree in Urban Planning or Regional Planning or Geography. Minimum of 3-5 years of work experience in urban planning with experience of urban infrastructure projects/ affordable housing/slum development projects. Experience of reform-oriented projects is desirable. Fluency in local language desirable. Educational Qualification: Postgraduate or graduate degree in Engineering with specialization in public health engineering or diploma in Engineering. At least 3 years of experience in procurement, design, and supervision of infrastructure works. Ability to assist ULBs to set standards and procedures for ensuring quality and monitoring compliances. Prior experience cis municipal engineer will be an added advantage. Fluency in local language essential. Educational Qualification: Postgraduate or diploma in Social Sciences, with practical experience of working with community/slums in the urban area. 3-5 years experience in undertaking social and community development initiatives and appraisals in the municipal environment. Experience in participatory methods, social mobilization, social analysis, resettlement and rehabilitation. Knowledge and experience in participatory planning and community mobilization. Educational Qualification: Postgraduate/graduate/diploma 1n Computer Science/Eiectron·ics or MCA/PGDCA. 3-5 years of work experience in government/semi govt. I autonomous organizations/private company of repute. Experience in software development and database management. Fluency in local language essential. Another relevant certificate if any.